….. A horse! A horse! My kingdom for a horse! 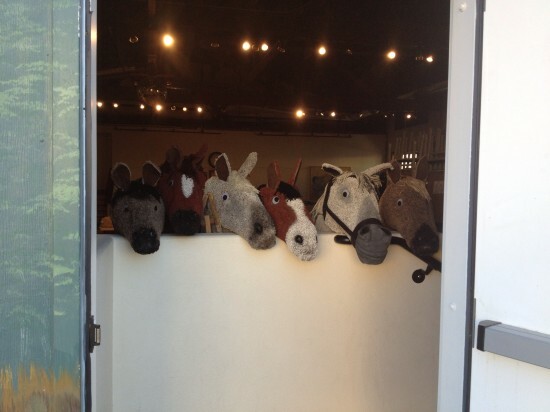 Not at all related to our catapult projects, comes this equine distraction I cooked up for our local theater group. Photo by Walter Henze. Truly a candid shot because we just had the horses stacked up for rehersal when someone happened to open the back door for ventillation at the same time Walter came by. Nice work! There are six of these kinetically animated hobby horses for our production of Cat Ballou. While they are all equipped with coconuts to make clipity-clop sounds, only Rudolfo (second from the right and also seen in this next video) has the ability to emote dynamically through his carpet head. And also a puppy…. my kingdom for a puppy. This is Oona. She is a well bred German Shepard with pure German and Checkoslovakian bloodlines. She is just 37 days old and this is her first trip outside to romp around in the grass and cast fretful glances at all the new sights and sounds. Find the bolt Oona! Find it girl! Ruff-ruff….